You start and finish each day in your bedroom. 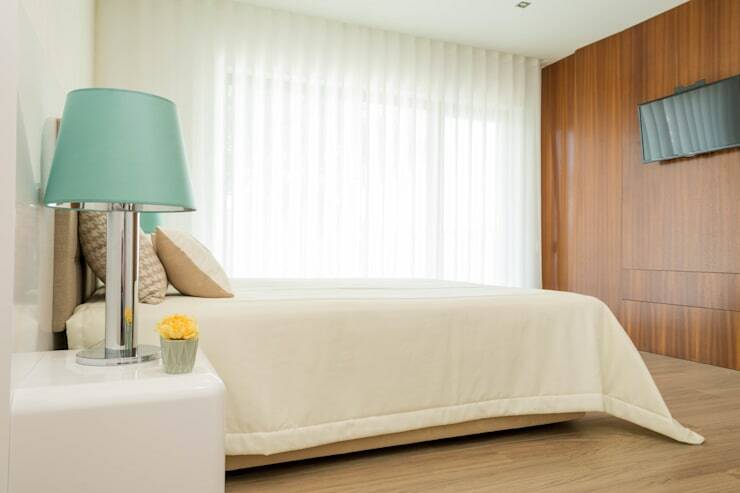 Give yourself the best chance at having a blissful day by making your bedroom calm and inspiring. 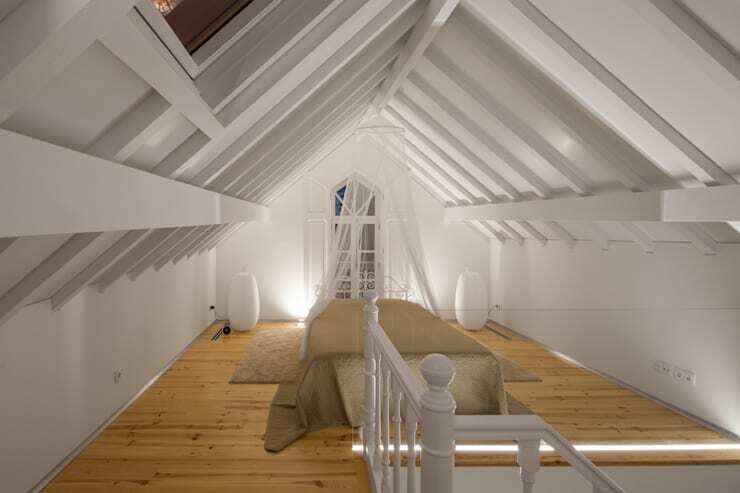 homify knows lots of interior designers and decorators who can help you achieve a calming bedroom. Let us show you 6 easy ways to make a bedroom designed for peaceful nights. Your bedroom should be a quiet retreat, not a multi-purpose room. Try to make your bedroom a place of solace by restricting electronics. The first and most easy to discard is the TV. There are plenty of other ways to entertain yourself in a bedroom without a TV. Also, try to keep your laptop and tablet out of the bedroom. Sounds impossible? Remember the original purpose of a bedroom. It's a space for you to wind down and sleep. Keep this goal in mind! You will find that your decor becomes more conducive to better sleep and calmer nights. 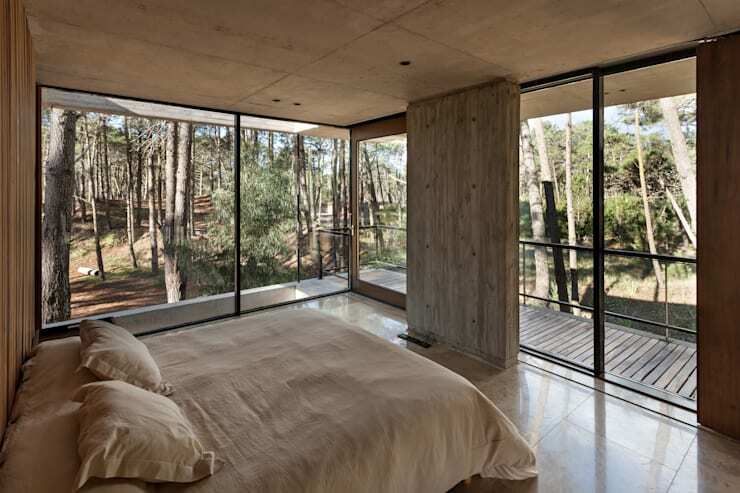 In this bedroom, they have minimized all distraction so that the space is clearly used for sleep. We also recommend putting in shelves for your favourite books if you don't want to go to bed right away. Colours affect us more than we realize. 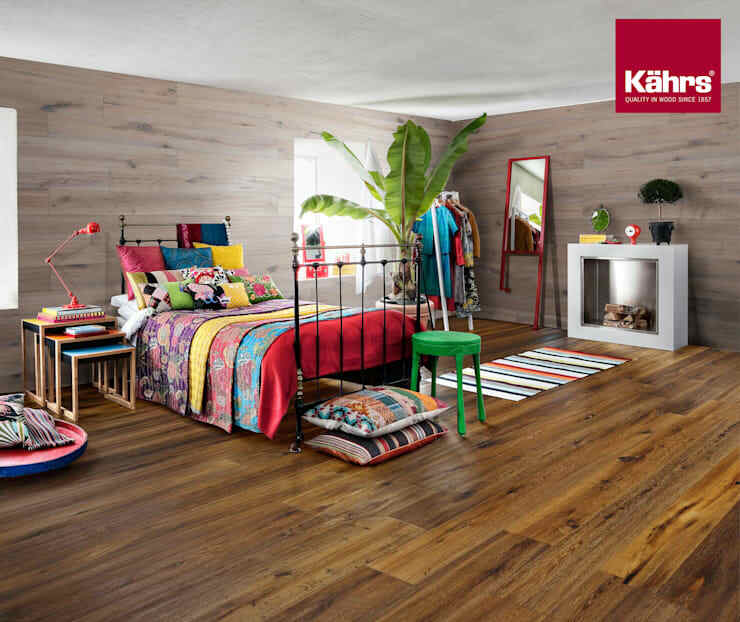 Having a zingy or bold bedroom colour is cause for excitement. If you have lilac or cappuccino coloured walls then they will help bring down the tempo of the room. If you're looking to set the stage for relaxation in the bedroom then keep your colours soft and light. 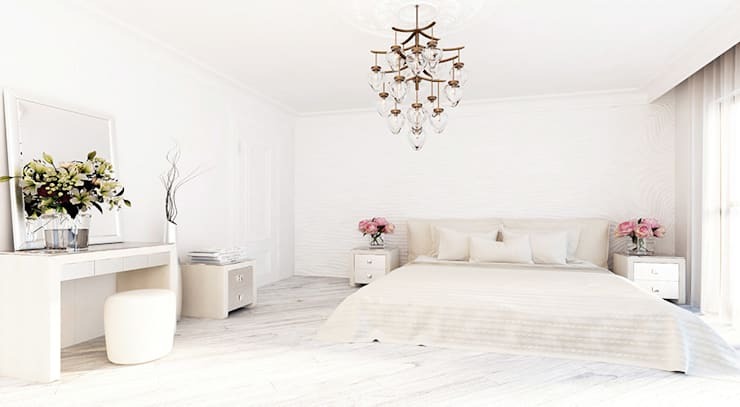 We love this bedroom done in a myriad of white shades. Bringing in some pastel coloured blossoms is livens up the room just so. Here the goal is to make things more subdued, natural, and effortless. You don't have to give up colour entirely! Just keep in mind that the fewer colourful distractions the easier it will be to slip off into dreamland. Curtains are a timeless and functional addition to any room. We recommend adding curtains to the bedroom because they help to block light and sound. Spend time carefully choosing the fabric and style of your curtains. Delicate textiles can add luxury to an otherwise plain room. Use gauzy and billowy curtains to softly filter the light in your bedroom. This helps keep the room bright and airy. If you need total darkness for sleeping you can also install a light blocking shade. You can still use curtains to help mellow the room. Arguably, lighting is the most critical design element of any room. It's especially important in the bedroom. You need to have layers of light to create the perfect lighting for any time of day. Lighting needs can also change with the seasons, so it’s better to be well prepared for dark winter days with enough lighting options. Overhead lights tend to be overkill! You need bright lighting for closets. soft lighting by the bedside for reading, and a warm flush in the room as you prepare to start or finish the long day ahead. 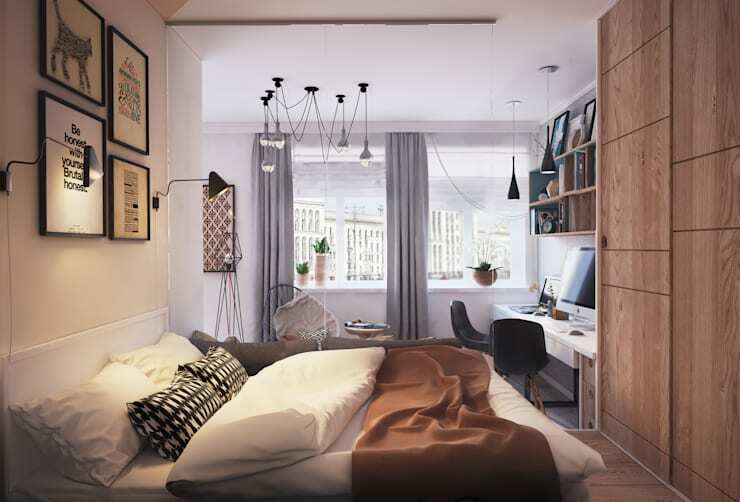 Try to make the best use of your natural light in the room and then start layering on lighting additions to create the perfect calming bedroom for you. Bedrooms can become full of stale air. That's why we recommend researching the best air-purifying houseplants that will go well in your home. Filling a bedroom with plants brings a fresh and earthy element to the room. They require a little maintenance, because they have to be watered, but they are worth the investment in your time. Having a room full of fresh air can help you sleep better. Plants are an inexpensive way to up the style and practicality of your bedroom. This kids' bedroom is guaranteed to always have fresh air thanks to the large air-purifying plant. You don't have to transform your home into a jungle, but a small plant here or there can do wonders for the overall calmness of your bedroom. Your bed is the most important element of your bedroom. It's at the centre of the design of your bedroom, so make sure that you choose a bed that you absolutely love. You are going to be spending a lot of time there, so choose wisely and splurge a little on the perfect bed. Having a bed that you love means that you'll be eager to go to sleep early each night and you'll wake up refreshed. Getting enough sleep is the easiest way to make your life more happy and healthy. Thanks for looking at these calm and inspiring bedrooms with us! For more bedroom design inspiration check out our feature on 8 stylish beds to inspire sleep. How do you wind down in the bedroom?